A horizontal sliding window makes an easy-opening window over kitchen counters and sinks. 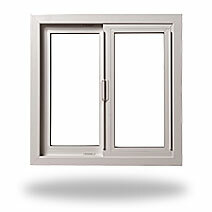 Some people find sliding windows easier and faster to open than crank-style awning or casement windows. What’s more, because sliding windows open without using any exterior or interior space, they work well in areas next to walkways, patios or other places where you wouldn’t want a window (such as an awning or casement window) to protrude. Every window and door purchase is different. Get pricing information and estimates on your project.